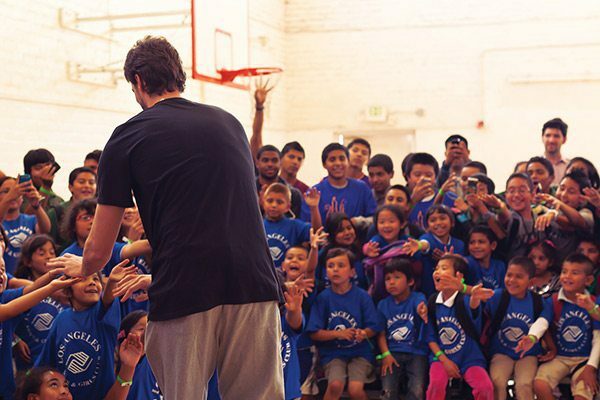 On Monday, June 3rd, Los Angeles Lakers star Pau Gasol hosted a rally to kick off The Healthy Competition at the downtown Los Angeles Boys & Girls Club. Monday’s event and the summer competition are the first events ahead of the upcoming launch of the Gasol Foundation, founded by Pau and his brother, Memphis Grizzles center Marc Gasol, to help combat childhood obesity. The Healthy Competition 2013, running from June 10-August 2, puts Pau’s Los Angeles team of 150 eager elementary school kids against Marc’s Memphis team in a challenge to see which group of kids can live a healthier and more active summer. Each team of youngsters will be gifted Nike FuelBands to track their daily activity and to monitor their team’s overall progress towards improving their eating habits and work out routines. The winning city will receive special prizes, while the team that finishes second gets to watch as their coach, either Pau or Marc, shaves his beard. At the rally, Pau was greeted by a standing ovation from the Boys & Girls Club members. After a round of high-fives, Pau took the mic and addressed the kids, explaining the details of The Healthy Competition and talking about the importance of eating healthy and being active. To culminate the event, Pau then challenged the kids to some basketball, allowing each kid a chance to try and shoot over him. It was a special event for the kids, but also a great opportunity for Pau to share the message of the Gasol Foundation and get the kids excited about having a healthy summer.